Each year the club makes the short trip across the Severn Bridge to run a Sprint event at Llandow Circuit in South Wales. The event has been running since 2002 and attracts an interesting mix of cars from road going saloons through to single seat racing cars. Competitors receive two timed practice runs and at least two timed competitive runs around a 1 and ¾ lap course. 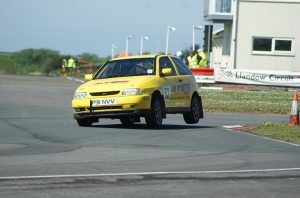 Our Llandow event is a round of both the South West and Welsh regional championships and normally attracts a number of one make club national championships. You can enter most normal cars in the road going classes, but you will need an MSA competition license and some safety equipment such as helmet, overalls and gloves. Plenty of advice for those new to sprinting is available from club members. Entry fees for a sprint are typically around £100.